A membership to Lehigh Valley Zoo is your year-long pass to unlimited Zoo daytime admission, valuable discounts and lasting memories. 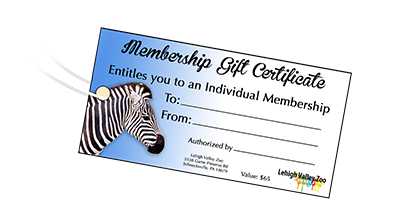 As a member of Lehigh Valley Zoo, you will enjoy exclusive benefits while supporting an organization that plays a vital role in wildlife conservation and conservation education. Free Daytime Admission for 12 months! Did You Know? Buying a Zoo membership helps to feed and care for all of our animals at the Zoo, a daily cost of $2,500 each day. You can save $15 if you renew your membership before it expires! Call today and renew by phone to receive the discount! **Please allow two (2) weeks for processing and shipment of your permanent membership card. It’s the Gift that Keeps Giving All Year Long! Have you ever struggled to come up with an idea for a great gift for a special occasion? Well, look no further! Zoo Gift Memberships are fun and thoughtful and give the gift of tons of fun all year long. And NOW we’ve made purchasing gift memberships even easier! Give a gift certificate for the appropriate level of membership— all we need to know is the recipient’s name and they can give us all the correct information at their convenience! Your gift membership will include unlimited daytime admission to the Zoo for a full year, plus exclusive member benefits, discounts and much more! Every time that special someone visits the Zoo, they’ll remember you! Give the gift of family togetherness, memories, unforgettable FUN and so much more. If you would like more information or to gift a membership please call Melissa Lint, Membership Coordinator at 610-799-4171 ext. 225. *Gift memberships cannot be processed online. Or Go Green! Call 610-799-4171. For more information on Lehigh Valley Zoo memberships, please drop us a line at mlint@lvzoo.org or call Melissa Lint, Membership Coordinator at 610-799-4171 ext. 225.